This is my way of explaining why I didn’t get my research done today. 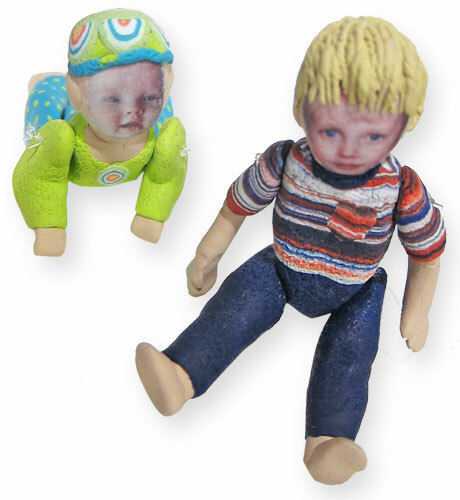 These 3″ sculptures are all about creative grandmothering with polymer. I loved the little sculptures that Leslie Blackford was making at the Ohio Bash weekend. This blue guy with an ominous face has bitten into a fish. He joins a whole group of mermaids, dogs and devils in striped pants. She’s posted a few finished ones here. While I can’t begin to channel Leslie’s wonderfully weird vision, I couldn’t wait to try making mini-me dolls for my grandsons. Leslie taught me that first you make a head using an easy photo transfer (with water and a laser print) and then you model a body and embellish it with abandon. I hope that my first clumsy attempt at photo transfer sculpture won’t scare my lovely toddlers. Not great art but I had great fun in the studio. Your grandsons are adorable! I am in awe of how cute your sculptures are. Beautiful work as usual. Thank you for sharing Leslie’s technique (also, thank you Leslie). Photo transfers; how interesting. I’d enjoy having a link to the “how to” of that. Your sculptures are delightful – I’m sure your grandsons were thrilled. Oh wow, these look great ! It is little Oliver and Henry! So adorable,I have not tried it with color transfers and these turned out really good. Oh Cynthia, those are a hoot! Thanks for sharing!!! Not clumsy at all. What a joy to be able to do. Maybe not as adorable as the real thing, but truly wonderful. 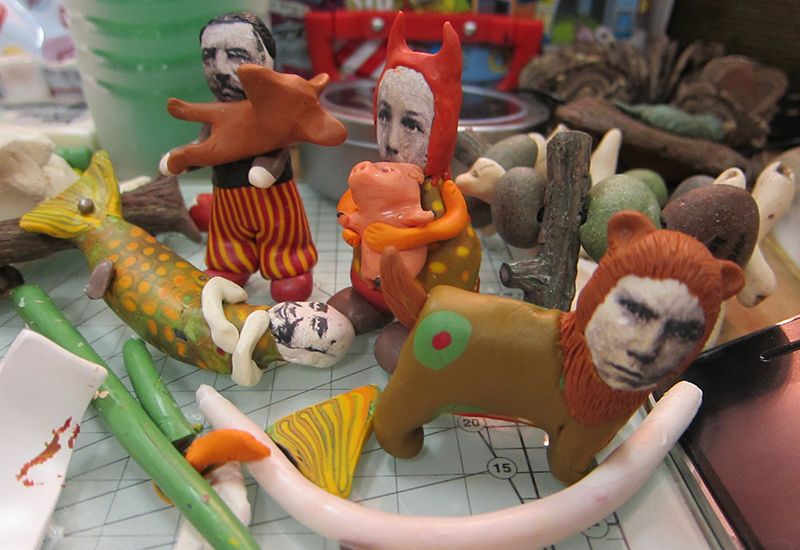 Leslie Blackford was one of my first loves in polymer clay–“I want to be able to do that.” Her new series (I adore redheaded boys) promises to be as fun as a circus! 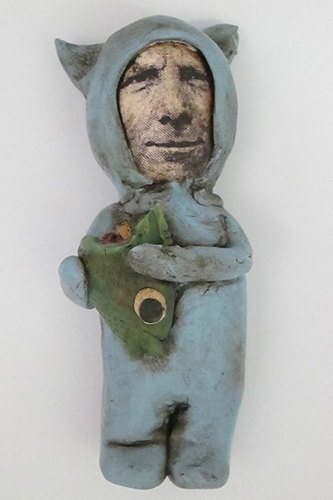 The blue guy eating a fish is Max from Where the Wild Things Are, only with an adult face — isn’t it?? Leslie takes the fear out of sculpting, doesn’t she? Hurray to you for making these cute little dolls of your living dolls.